With Spring arriving in 23 days, the farm is beginning the transition from surviving the bitter cold to nesting and reproduction - the Birds and the Bees. First the Birds. I sent my daughter the picture below and asked her if she could guess what happened? 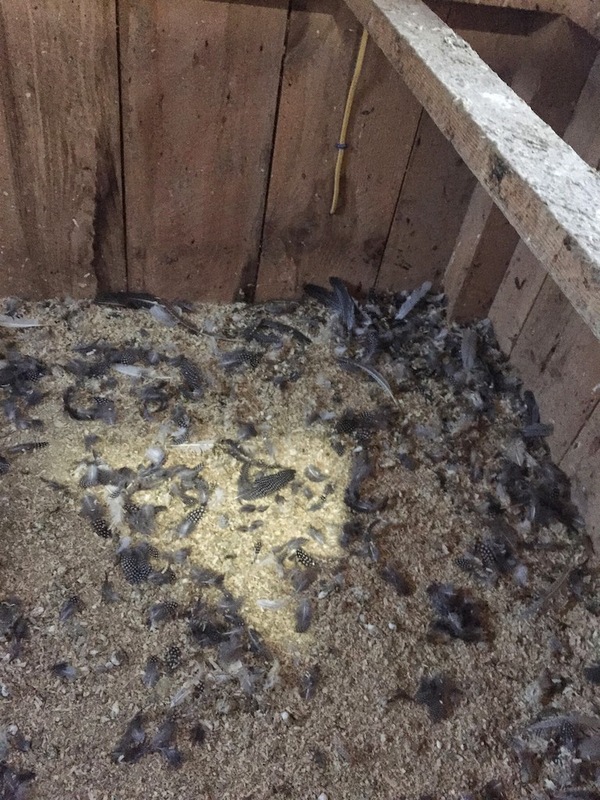 Over the weekend, I went into the coop to fill the feeders and found a dead guinea surrounded by a pile of feathers. I looked up and a large red tail hawk was standing on the roost above my head. I removed all the guineas/chickens and closed the coop door. Not knowing how the bird would respond to my interventions I asked Kathy to supervise me in case I was attacked. Wearing my kevlar work gloves I gently picked up the bird by its talons and placed it on my arm so I could walk it out of the coop. The bird and I had a conversation for several minutes. I explained that I respected its position at the top of the local food chain, but that Unity Farm could not be a weekly smorgasbord during the lean times of winter. As you can see in the picture, our discussion was intense - direct eye contact and uninterrupted focus. The bird and I walked to the orchard and I encouraged it to fly by gently moving my arm up and down, exercising the raptor’s wings. The bird then flew off, circled the barnyard once, and roosted in a tall old maple snag. 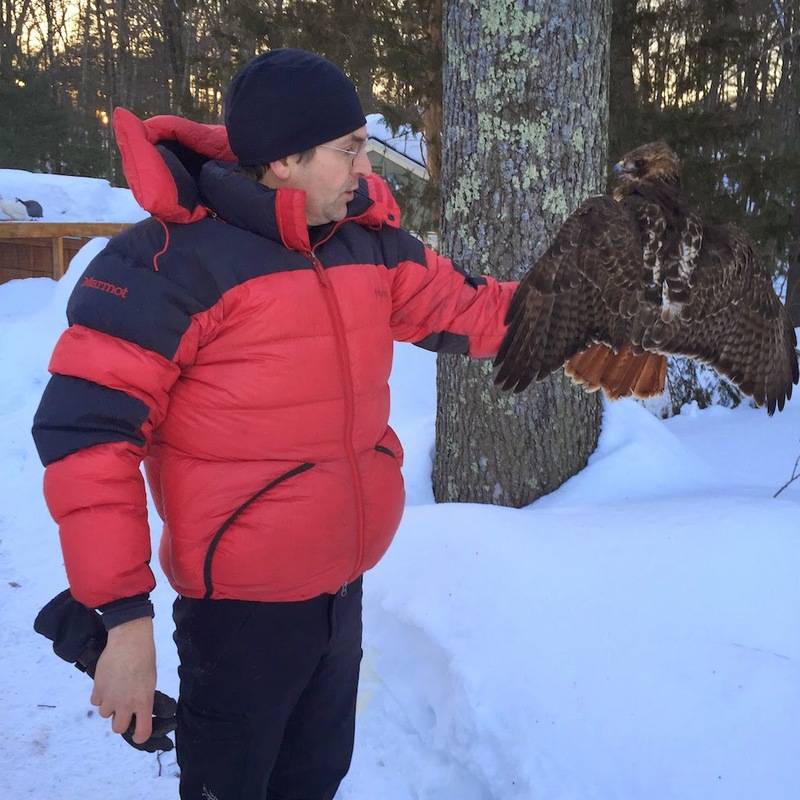 Although I have no desire to take up falconry (it’s not very vegan), I did read about the history, training techniques, and bird personalities involved in the sport. 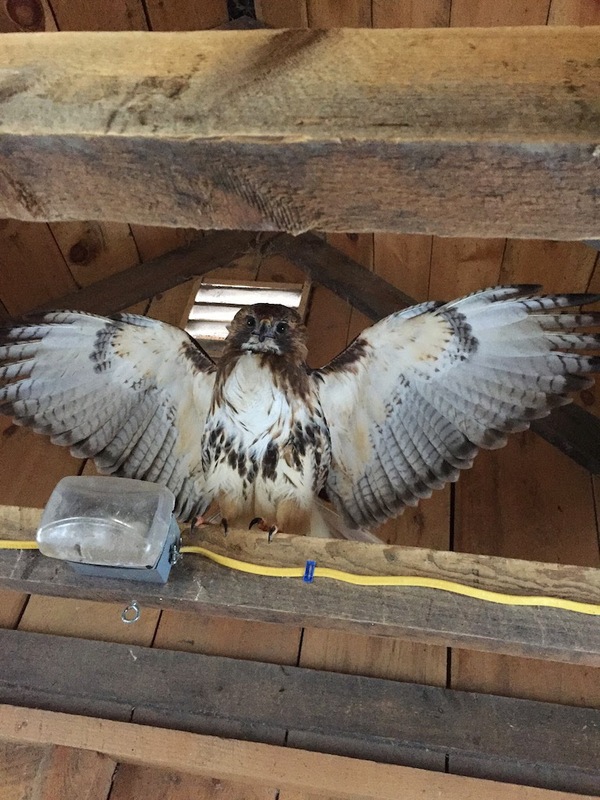 Red tail hawks are known for the equanimity - a very even temperament. They never develop affection for their handlers, but they do develop trust. Given the chickens, ducks and guineas at Unity Farm, we do not want the hawk to visit often. On Sunday, the temperature rose above freezing for the first time in a month. The bees cannot fly below 40 degrees, and in general, we do not open the hives below 50 degrees. Bees do not excrete in the hive, so they have had to “hold it” for the past 30 freezing days. As soon as the temperature hit 45F, our 100,000 bees began their cleansing flights. 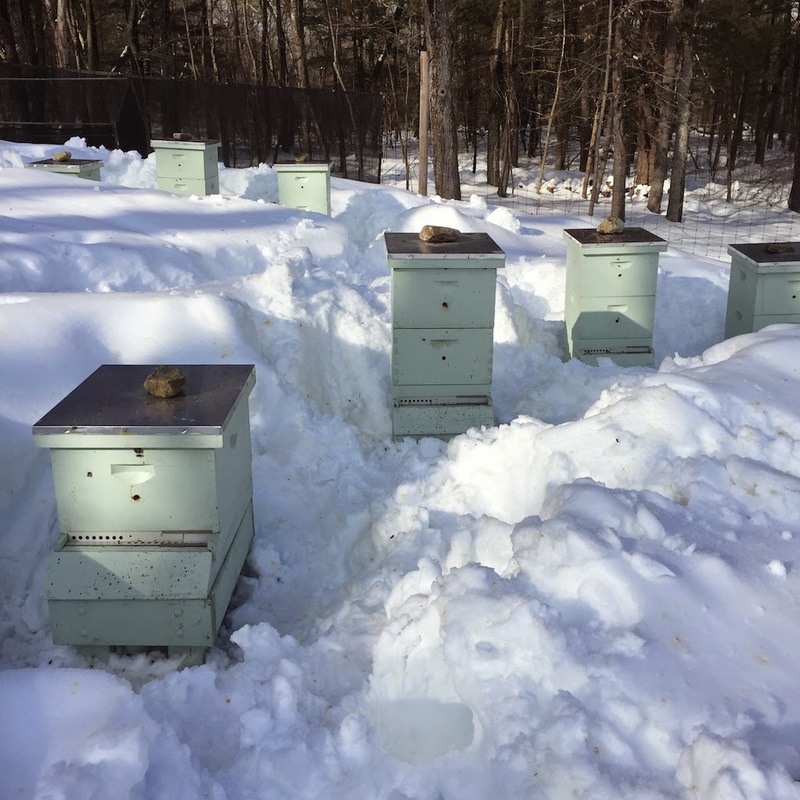 We have not been able to open the hives since January, so we had now idea how the hives were overwintering through -10F temperatures and weekly snowstorms. Every Sunday I have shoveled out the hives, but the snow between the barn and the hives requires walking 1/4 mile in 7 foot deep snow - challenging even with snowshoes. A stethoscope can be used to listen for “buzzing”, a crude measure of hive survival. My initial examination suggested that two of the twelve hives had not survived the unusually brutal winter. Clearly we needed to do an emergency inspection and decided that the 45F temperatures would be sufficient for a very quick look. I carved a path to the hives and Kathy brought 18 sheets of fondant (sugar icing). One by one we opened each hive and added food. As we feared, two hives did not survive, but we found no clear evidence of nosema, american foulbrood, or heavy varroa mite loads. Once the weather warms we’ll look at all the hives, frame by frame. One possibility is that the snow drifts were so high, the warmth of the sun from the south was blocked by the shadows of the enormous piles. Next week, the snowblower attachment for the front loader arrives and I’ll be carving paths, reducing drifts, and making management of the entire farm infinitely easier. I’ve worn out my alpine climbing gear by simply traversing the farm this winter. Using a commercial snowblower is a much better strategy than an ice ax, snow shoes, and total body vortex. As March begins, I’m hopeful the snow will stop and the sun will shine, warming the hoop house to the point we can begin planting. Maybe next weekend I can finally get the peas in the ground. 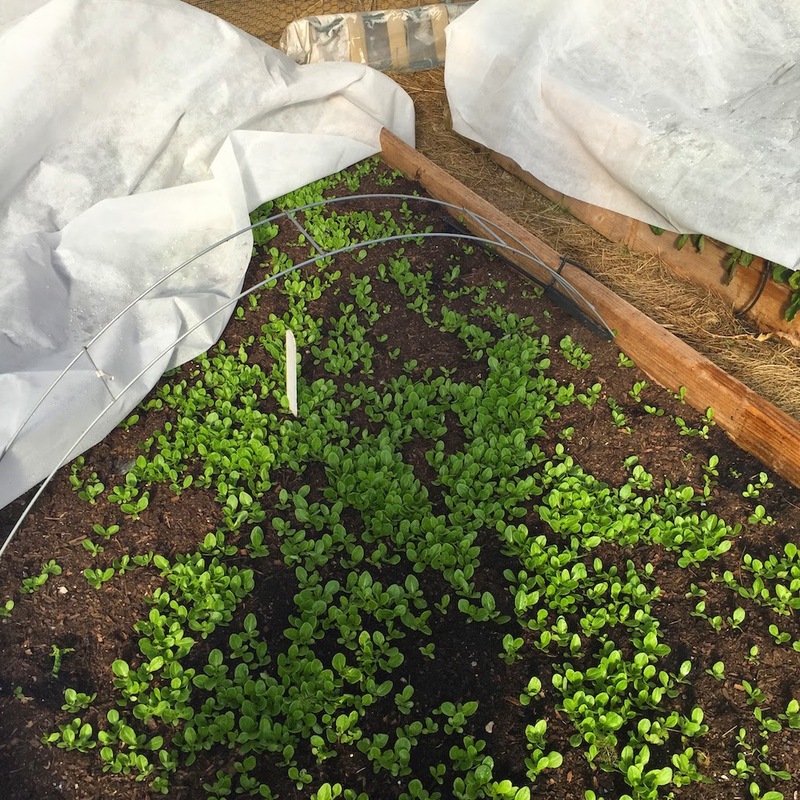 The lettuces, spinach, chard, bok choi, and mache have overwintered well - we’ll have our first harvest in early March.